This photo was taken at Hemkund Lake, Hemkund Sahib, Chamoli, Uttarakhand. 4:30 am we were getting ready for next 6 km steep trek. Had bath with Rs. 50 hot water bucket. 5:30 am we started Ghangaria Hemkund trek. 5:45 we were walking nearby a waterfall while having a look at frozen water. We cross a bridge over Pushpawati river flowing from Valley of Flowers. 7:20 am i.e., after almost 2 hours of steep trekking we stop for breakfast. 7:45 am we re-started our journey. Many times during trek I thought of hiring mule but NO. 10:20 am we reached the first glacier. This is the point where mules / horses journey ends. Note: one can reach Ghangaria from Govindghat via Helicopter, trekking, mule, kandi or palki but from Ghangaria trekking, mule, kandi, palki is the only option till you reach first glacier. The first glacier was approx. 20 meters in length and maybe 6 feet wide. The valley down below was clearly visible. I tried to cross on own and slipped in the middle of glacier but I was in control. I stop self for further walking. Anup Rawat – a horse man was standing alone on the other side of the glacier. I requested him to come. He helped to cross the first glacier. Thank you – said I and a small amount of donation for his help. Second glacier was not too far. The stony path was clear with no snow. Easy cross this time. Further stony trek from both sides was covered with thick layers of snow. One can hear Shabad Kirtan the moment one is nearby glaciers. Nishan Sahib (Sikh holy triangular yellow/orange color flag) is also visible. The distance to trek is approx. 2 -3 km yet. The 5 – 6 feet wide path is one sided covered with snow and other side is deep valley also covered with snow. It was a new experience because I haven’t trek within snow till-date. Thoroughly enjoyed. 12:30 noon hours we reached Hemkund Sahib. Total Trek Time from Ghangaria to Hemkund Sahib was 7 hours approx. including break-time. While returning Hemkund Sahib to Ghangaria we started our journey at 2 pm after listening ArdÄs. 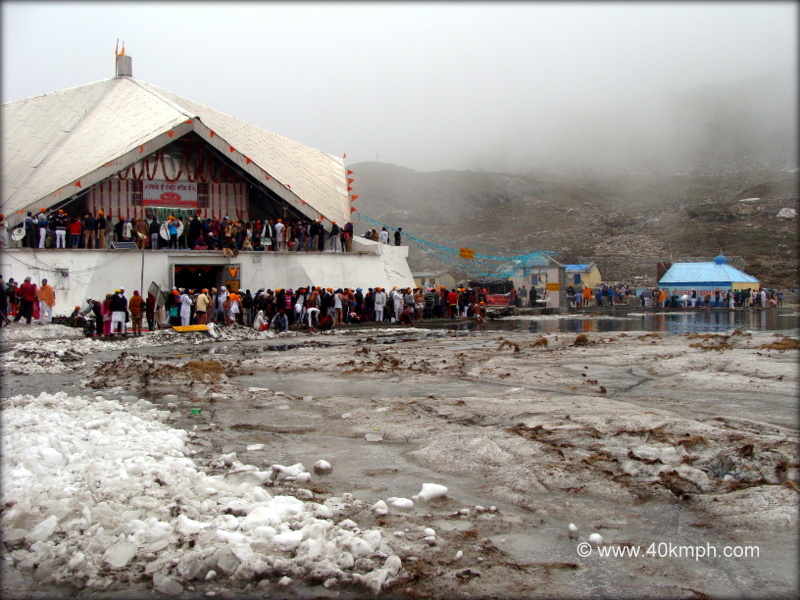 Nobody is allowed to stay at night at Hemkund Sahib. Most of the pilgrims start their journey after 2 pm. 3:10 pm I crossed the second glacier with the help of a porter – Kishan. 6:00 pm we reached Ghangaria. Total Trek Time from Hemkund Sahib to Ghangaria was 4 hours approx. including break-time. In short I haven’t done trekking a lot but I have to say Hemkund Sahib visit was the best I had till-date. Little costly because hotel rates the minimum I found was Rs. 800 for single bed with attach bathroom/toilet. Food was costly too but still picturesque trek indeed.